If you just realized you left your curling iron on, feel free to step away from this review with a pretty solid idea of what Block N Load feels and plays like. It’s a simple concept but a joy to see in action. 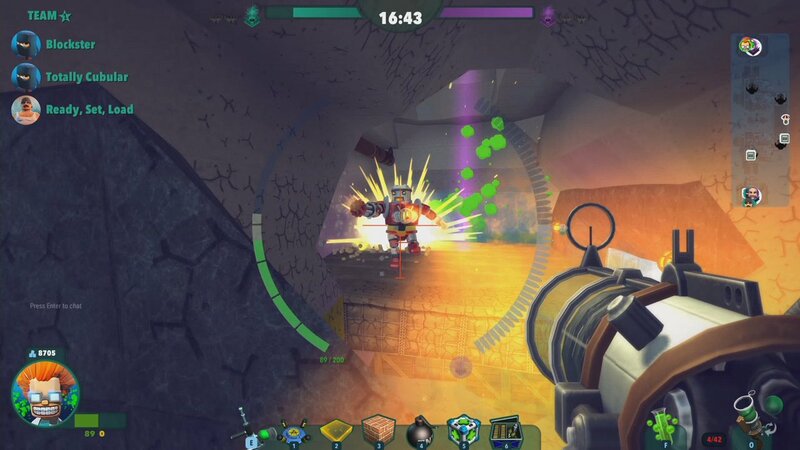 And while Block N Load doesn’t do everything it could, the execution is strong enough to realize a great idea. 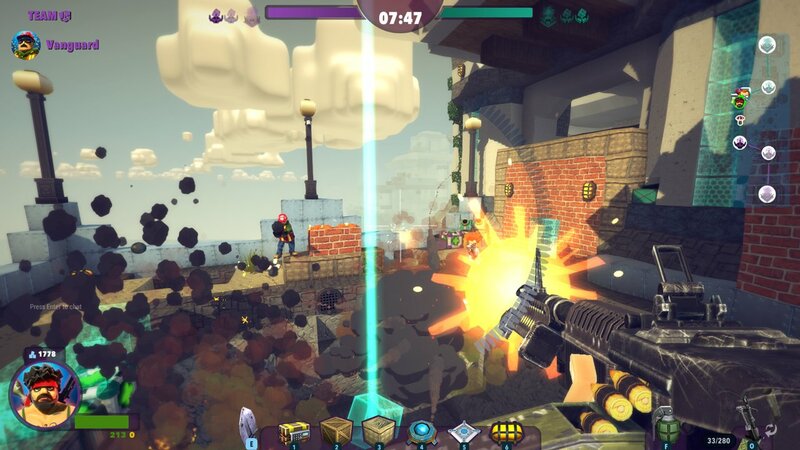 Block N Load is a team-based shooter, but it’s no simple death match. 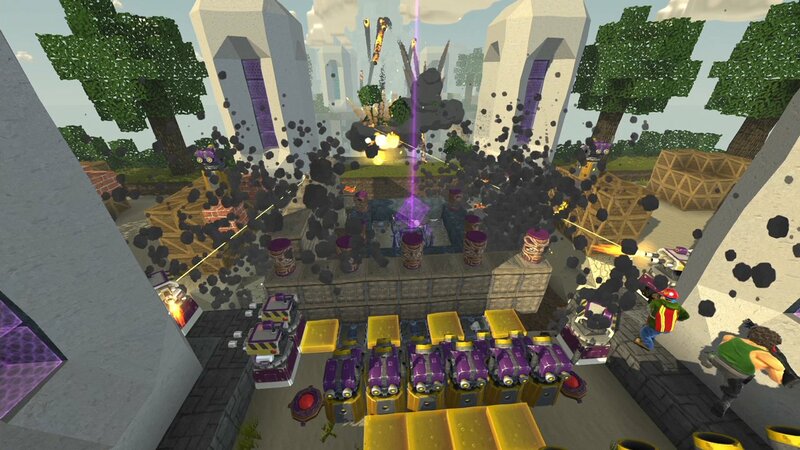 Right now there’s only one game type: players must destroy their opponents’ “cube,” a kind of shield generator, before breaking into the enemy base and smashing its core. 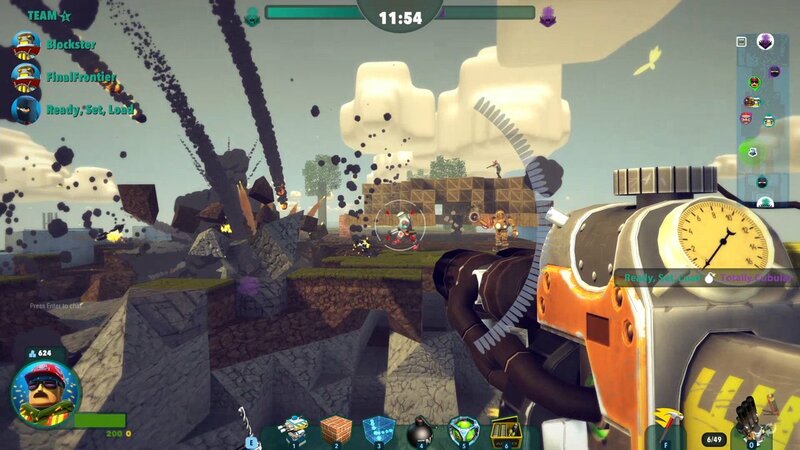 This target-based gameplay works well with the mechanics of Block N Load, as players are forced to build and breach defences in ingenious ways. Has the other team destroyed the stairs leading up to their tower? Build a sky bridge and drop down on them from above. Are they hunkered down in a heavily fortified base filled with turrets? Dig a tunnel underneath and blow up the floor with explosives. That’s without mentioning any of the special blocks. Try digging a pit, filling it with mines and then covering the top with a layer of illusory blocks. Place a speed-booster next to a bounce pad and leap your way across a quarter of the map. Dig a trench and cover the edge in glue, so your opponents can’t get enough speed to make the jump. The strategies go on. Plus, a decent variety of maps encourages you to use different tactics on different terrain. Even if you’re not the sharpest shooter, you can still be a great asset to your team by building clever defensive structures. Laying down blocks is critical on offense as well: the single-most useful thing you can do is hide a forward base so your allies can respawn deep in enemy territory. While you won’t construct any elaborate monuments that will stand the test of time, it’s great to see a shooter that rewards creativity in addition to skill and teamwork. 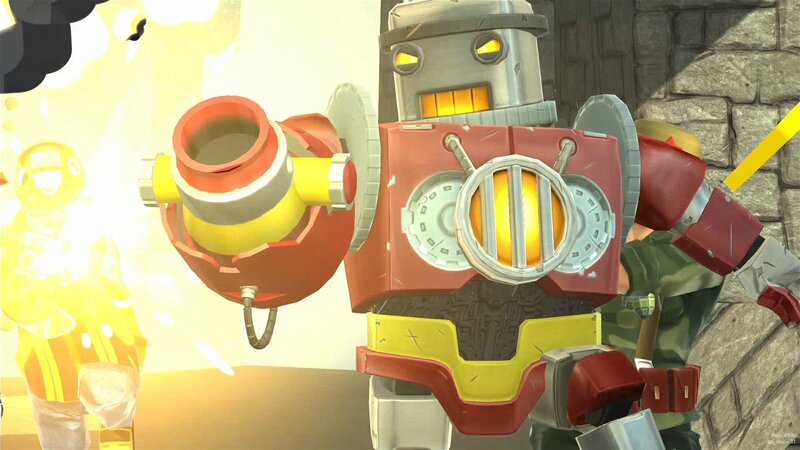 Unfortunately, the combat side of Block N Load is merely serviceable. The game favours a slower pace than most shooters, with more health and a moderate run speed. It’s a wise choice; twitchy one-hit-kill combat would render time-consuming constructs fairly pointless. While not terribly interesting or original, most classes have special abilities that play well with the construction/destruction concept. 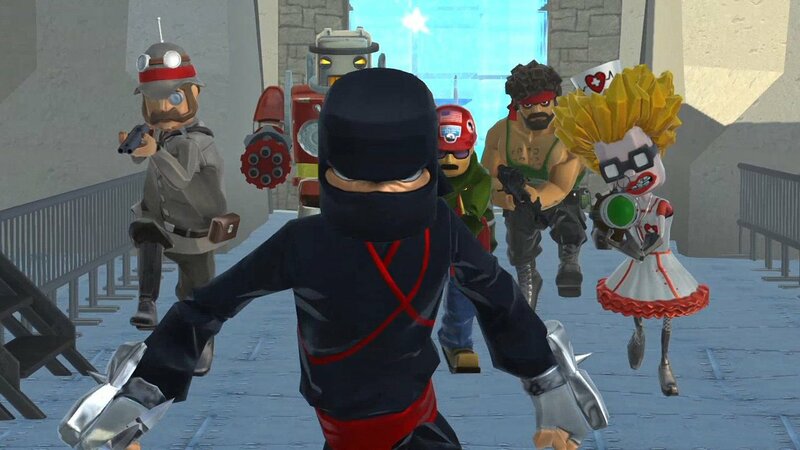 The ninja can climb walls, which is a godsend when the map gets chewed up. The engineer is able to repair blocks with his caulking gun. The classes are generally well-balanced, although the lack of even a mediocre long-range option for the engineer is infuriating. With only a shotgun and your turrets at your disposal, enemies are free to stand in plain sight and pepper you with gunfire from a distance. It’s also unfortunate to see players receive permanent bonuses, such as faster reload speed, the more time they invest, meaning experienced players will have additional advantages over new ones. What the block were they thinking? Yes, it’s the little things in Block N Load that threaten to spoil the experience, demonstrating a lack of polish and subtlety. The controls are a bit loose; in order to climb a pair of stacked blocks, you need to hold the sprint and jump buttons – which you better release right away, lest you fly off into a pit of lava. It’s hard to tell your enemies and allies apart, as your opponents’ character models are not coloured differently. Savvy opponents can make defending your cube an exercise in extreme frustration. Crouching and playing ring-around-the-rosie is a common tactic. Most classes lack a melee option, meaning you’re likely to miss and shoot your own cube by mistake, eliciting an annoying buzzer sound and a rebuke from the announcer. But the most grating element of Block N Load is the humour. You had better find the phrase “what the block” hilarious, because you will hear it a lot. In fact, every class spouts their catchphrases with absurd regularity, sometimes the same line just seconds apart. Cogwheel says cliché robot things, O.P. Juan Shinobi says cliché ninja things, Nigel Purdey-Longshott says cliché British things and so on. Thankfully you can unlock skins that give the characters a new personality – and with it new lines to repeat ad nauseam. 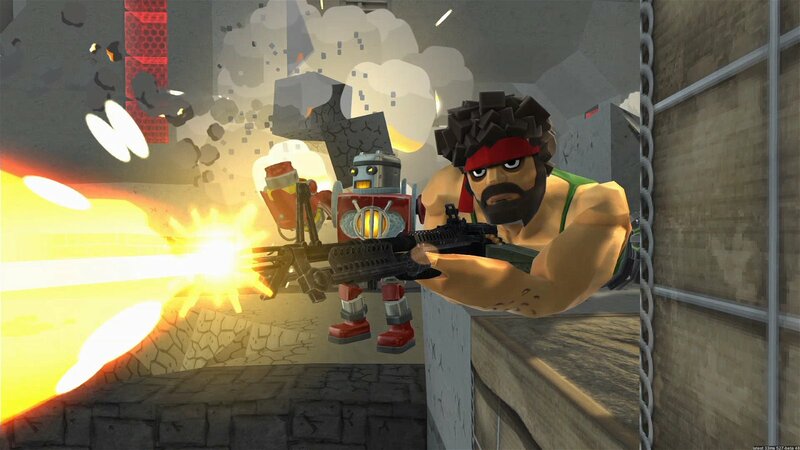 Unfortunately, the combat side of Block N Load is merely serviceable. The game favours a slower pace than most shooters, with more health and a moderate run speed.